The 2014 Award Circuit will be a collection of reviews of films that are in some kind of award runnings within the months of January through March. Not only will this prepare me for the big night (AKA Oscar Night), but it will also allow me to catch up with some of the critically acclaimed films I missed out on in 2014. I hope you enjoy reading them as much as I enjoy watching and writing them. Its that time of year again, I have already watched one awards ceremony before seeing all the movies I could see. That is about to change now, and its time for me to get going on catching up with all the Award Circuit movies. Like last year, I will catch up on all the movies that are being flooded with awards buzz, as usually those movies don't get released to the masses until months later. This will give me enough knowledge to make my Oscar predictions in a couple months. I hope you enjoy. I am more than happy to start with "Inherent Vice." I saw this movie on Monday night, and I purposely let the movie sit in my brain for a couple days. I needed to chew on it, I needed to let it sink in. This is a Paul Thomas Anderson movie, a director who has made incredible movies. But sometimes those movies need to be thought about for a couple days, perhaps even seen more than once to fully digest. When I saw "There Will Be Blood" in 2008, I was in high school. I'll admit I didn't fully appreciate what that movie created, and I didn't understand what all the fuss was about. After I saw again a few years later, I was overwhelmed by the craft. I also had to watch "The Master" in 2012 a few times before I made my final decision on it. Anderson's films are multi-layered, they are complex, they are dense. But at the same time, they are filled with entertainment during every frame. Not all of his movies had that huge thought process, both "Boogie Nights" and "Magnolia" floored me the first time I saw both them, and each of those movies became personal favorites of mine. Paul Thomas Anderson makes great movies, but he is an unusually unique artist and sometimes, you have to work for his films. "Inherent Vice" may seem like a batch of A-List actors showing off, and I can understand why someone would think that. This is the most shamelessly pleasant use of popular actors in a crime movie since "The Departed." But it becomes apparent pretty quickly that these actors are just clashing with the script, blending into the goofy, woozy world that P.T. Anderson creates. These actors may look like they are having fun, but the script they are working with is so much fun to listen and view that its easy to see why this cast threw themselves at it. 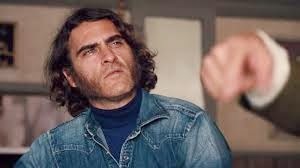 Especially Joaquin Phoenix, who turns out another great performance under Anderson's eye. Just as much as Scorsese and De Niro were a perfect artistic match, it seems the same can said of Anderson and Phoenix. Phoenix did the best work of his career in 2012 in "The Master," and once again in "Inherent Vice" he turns out an unbelievable performance. Phoenix leads us through this grungy, dreary landscape of 1970's Los Angeles. During a time when drugs were easy to find, prostitutes were easier to find, and the hippies were trying desperately to hold onto the 1960's. In the middle of all this is Larry "Doc" Sportello (Phoenix), a private eye who breaks up with his girlfriend Shasta Fay (Katherine Waterston) at the beginning of the movie. A few months later, Fay disappears, apparently kidnapped with her new lover Mickey Wolfmann (Eric Roberts) and he on the case to find out what happened to her. Only to stumble down a strange road of drugs, murder and money. This is essentially what "Inherent Vice" leads up to and it is interesting how P.T. Anderson creates a sprawling epic out of something so simple. While Phoenix is really good, it seems the rest of the cast spends the movie trying to match him. Josh Brolin gives a lifetime performance as Bigfoot, a high-profile policemen who recruits Doc for help. Benicio del Toro also plays a cop helping Doc. There is also Reese Witherspoon, Martin Short, Owen Wilson, Maya Rudolph, Michael K. Williams, and Jena Malone. This is easily the best cast a movie could ask for, and what blew my mind was that the highlight of it all was the work by Katherine Waterston. It's her performance which gives the movie its life, she is the rock of the entire story and relishes every moment of it. I love how this cast adapts to the wicked sense of humor Anderson creates and how they are able to jive with his unique language in the script. Not every cast could pull this off and it seems Anderson found the right people instead of the best people. To say "Inherent Vice" is an experience would be an understatement to the word experience. Much like many P.T. Anderson movies, "Inherent Vice" is a surreal dream of a movie, a story which feels out of place and time but absorbing nonetheless. It may not ring to everyone's taste and it maybe something you need to watch more than once to appreciate, but it is worth every single minute of your time.